Fines and fees are the monetary amounts and punishments imposed on an individual who commits a crime or other offenses. They affect local communities across every state and in different stages of the criminal justice system. 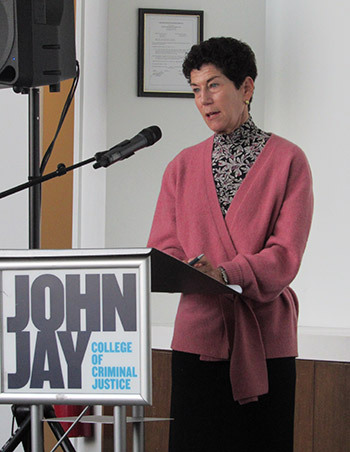 To speak about the impact of fines and fees, John Jay’s Center on Media, Crime & Justice (CMCJ) held a Cash Register Justice Event on March 7 and 8. 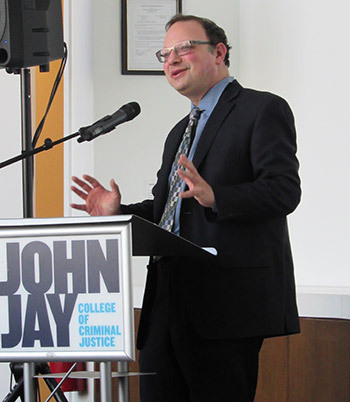 During his welcome speech, Stephen Handelman, Director of the CMCJ, highlighted the importance of conferences like these. 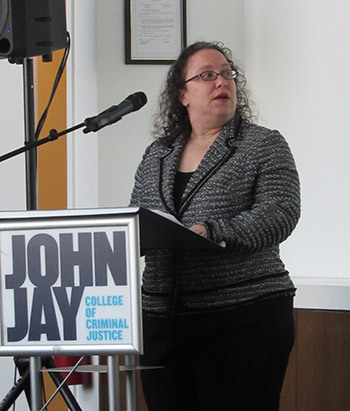 “What we hope will be produced out of these conferences is an ongoing network of information between the media and criminal justice experts to continue talking, learning and educating yourself about the alternatives and innovative strategies that are being used to change the current system of fines and fees,” said Handelman. 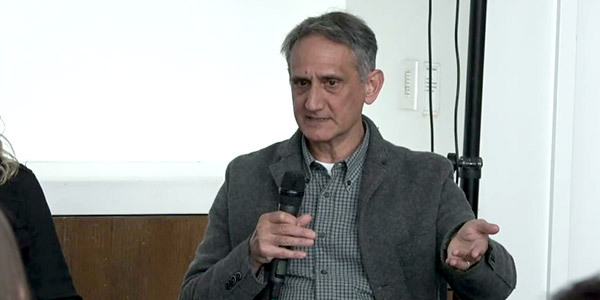 The two-day conference featured panels covering topics such as: The Media and Cash Register Justice, The Incarceration Trap, and the Costs of the Juvenile Justice System, offering journalists the chance to listen to criminal justice experts and encourage them to share the information to promote change. Weiss, presented next. 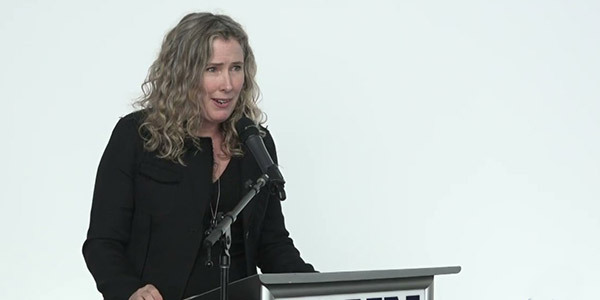 Adding to Harris’ presentation, she stated how the incarceration rate over the past 40 years has gone up by 400 percent and how the United States has about 25 percent of the incarcerated population in the world. 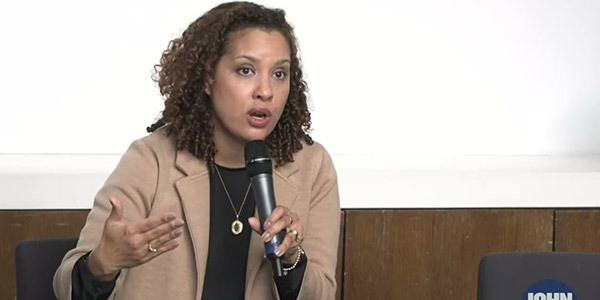 While she highlighted the sharp increase in incarceration and its costs to counties and states over the past three decades, she made sure that the audience knew that the biggest change happened with Ferguson, Missouri. “In 2014, the city of Ferguson exploded. A police officer killed a young black man called Michael Brown, and night after night the community gathered in protest,” said Weiss. “What the community and that unrest showed us was the public distrust of law enforcement and the entire criminal justice system.” After many nights of protests, the Department of Justice’s Civil Rights Division decided to conduct an investigation into what was occurring in Ferguson. What they discovered was the link between the municipal courts, the police department, and the Mayor’s office. “The city was using the justice system, from police to the courts and even the jails, as a way to raise a substantial part of the revenue for the town of Ferguson. The police were ordered by the city to fill the revenue pipeline by issuing tickets which they largely did in black communities in Ferguson,” said Weiss. “In a single traffic stop, police could issue up to six citations. Those tickets were adjudicated in the municipal court and if you missed a payment or if you missed a single traffic date, there was a warrant issued for your arrest. When DOJ conducted their investigation, the town of Ferguson had 21,000 people and it had 32,000 open bench warrants for people's arrests.” Weiss pointed out that this wasn’t just occurring in Ferguson. Looking at Buffalo, New York, Weiss stated that between 2014–2017, 17 percent of traffic stops were for tinted windows which were seven times that of speeding. However, when looking at the causes of vehicle accidents, speeding was the factor of 1,753 crashes whereas tinted windows were only to blame for two. 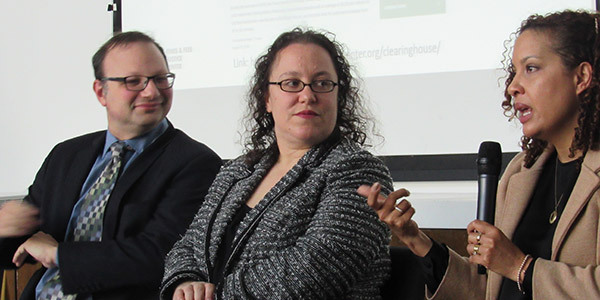 After days filled with panels speaking on the fines and fees, debt, and its implication on the individuals within the criminal justice system, the Cash Register Justice Event, had one last panel to round out the two days. The topic? Alternatives and Solutions. Moderated by Handelman, the panel included Anne Stuhldreher, Director of Financial Justice City and County of San Francisco, Jon Wool, Vera Institute of Justice, Beth Colgan, UCLA Law School and Brook Hopkins, Executive director of the Harvard Criminal Justice Policy Program. Stuhldreher, began, speaking about the work that the Financial Justice Project has done that can be used as a guide for other cities. “San Francisco was the first place in the nation to get rid of all our fees that we charged to people exiting the criminal justice system. We wrote off $32 million in debt that was hanging over 21,000 people. We cut toll fees in half for lower income people and we cut boot fees by more than 80 percent.” She also spoke about those who used payment plans to pay their parking tickets. “You had to pay $65 to get onto the payment plan and then the ticket would double through late fees,” Stuhldreher said. “We cut the payment plan fee to five dollars and got rid of the late fees for lower income people. The idea was that if we could make things easier for people to pay, they will pay. Three months after doing this, the percent of people getting on payment plans, went up by 400 percent and the amount of revenue coming into the San Francisco Municipal Transportation Agency went up as well.” Extending support to the homeless, Struhldreher mentioned the program that the DA of San Francisco program which offers the homeless social services to eliminate any citations they have. Wool, on the other hand, offered a solution that not many expected. Speaking about the work he’s doing in New Orleans, Louisiana, he told the audience that fines and fees should be eliminated. “We are going for eliminating the fines and fees all together. There's simply no justification and with the legal situation in Louisiana, you'll see that it's not legal in any state because it is so structured to benefit not just the system actors in general, but the judges themselves,” stated Wool. “There should be an all or nothing question in mind in terms of fines and fees, and anyone who wants to do a little less than all, it's good and fine, but we should imagine a world where we don't tax the most vulnerable members of our community.” Wool mentioned Louisiana’s current state-wide reform that mandates the ability to pay. “The state-wide reform mandates ability to pay, precludes extending probation for non-payment, you can only do it once for six months, and limits the monthly payment to the salary of one day's work. It has all the elements for the ability to pay framework,” he said. Even with this, Wool noted that there are some problems with the current reform. “First, this reform keeps getting pushed back because the judges don't want their money being tampered with,” said Wool. “Second, they made it in the end apply only to felonies. It's a strange thing. You can only be more punitive to misdemeanors when you know it's not about punishment or accountability, it's just about the money and the money is in misdemeanors.” He also mentioned that what occurs on the state level isn’t helpful to New Orleans and vice versa. With some last remarks, Wool and everyone on the panel acknowledged that while some work has been done to reform the fines and fees system, more work needs to be done especially to eliminate hurting those in lower income and minority communities.